These beetles were found in abundance along Camp Creek, Maricopa County, Arizona 30 Aug. 2008. Most were feeding on leaves of Wooly Bursage (Ambrosia eriocentra), however, the above specimen was on Canyon Ragweed (Ambrosia ambrosioides). The foliage of bursages and ragweeds, Ambrosia spp., are mostly very distasteful to cattle and so frequently become over abundant on rangelands in the Sonoran Desert. 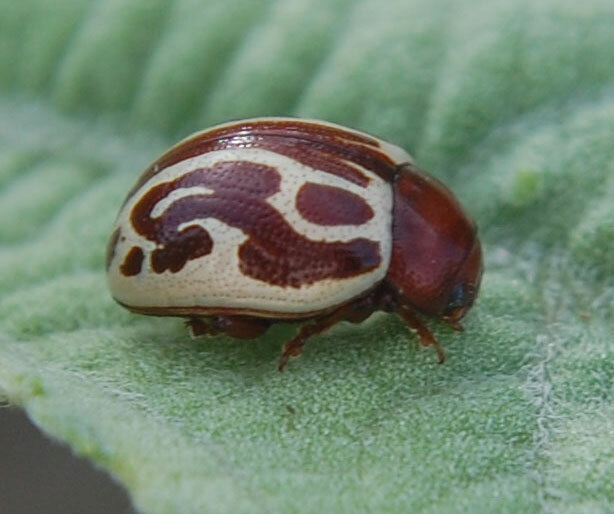 These leaf beetles are specialized to eat the leaves and under certain conditions they can become abundant enough to defoliate the plants to a considerable degree. Once cattle are removed or limited on overgrazed range plant populations such as these will be reduced by the insect feeding. Mike Quinn reports a dozen species of Zygogramma in North America north of Mexico. Each specializes on a mostly narrow group of related plants. Journal Reference: Goeden, R. D., Ricker, D. W. 1979. Life history of Zygogramma tortuosa Rogers on the ragweed, Ambrosia eriocentra (Gray) Payne, in southern California (Coleoptera: Chrysomelidae). Pan- Pacific Entomologist, 55: 261-266. Copyright Michael J. Plagens, page create 4 Sept. 2008.